Executive Mosaic is pleased to announce that Jim Reagan, Executive Vice President and Chief Financial Officer of Leidos, has been inducted into the 2018 edition of the Wash100 — Executive Mosaic’s annual selection of the most influential voices in the government contracting arena — for demonstrating excellence in executive management, mergers and acquisition, and financial analysis and relevant business processes. This makes him a three-time recipient of the award, having also been selected to the Wash100 in 2016 and 2017. Leidos Holdings Inc., a widely-recognized provider of science and technology solutions to the government and commercial sector, appointed Reagan as EVP and CFO in July 2015, putting him in charge of overseeing all financial activities, including but not limited to accounting and financial reporting, tax planning and investor relations. He played a crucial role in the company’s merger with Lockheed Martin’s former government services business a year later, which positioned Leidos as the largest government services provider in the U.S. with $10 billion in annual revenue. By 2019, Reagan has forecast that Leidos will receive $1.2 billion in cost synergies and more than $425 million in revenue synergies. “Where we see the money in the budget falling makes us feel confident about the outlook for where funding sources are and where that is going to be spent relative to the priorities of the government,” he told investors in May 2017. From humble beginnings at PricewaterhouseCoopers LLP, Reagan went on to serve as Chief Financial Officer at PAE Inc., Vangent Inc., Deltek Inc., Aspect Communications and American Management Systems, eventually assuming a senior VP role at Vencore Inc. (formerly The SI Organization) prior to joining Leidos in 2015. 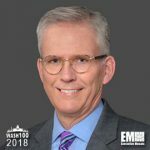 He was named “Best CFO” by the 2018 Institutional Investor All-America Executive Team alongside Leidos Chairman, CEO and 2018 Wash100 inductee Roger Krone, and Senior Vice President of Investor Relations Kelly Hernandez. Executive Mosaic congratulates Jim Reagan and the Leidos team in receiving this award.